No, this post is not a free pass to eat an endless amount of Skittles. It is, however, a free pass to eat the rainbow when it comes to fruits and vegetables. The simple fact is: the more color you consume, the more nutrients you provide for your body and the more satisfaction you feel with your food choices. Since we know our brains prefer variety when it comes to satisfaction and satiety, we can use that to our advantage to add more fruits and vegetables into our diet. Nature has made it easy for us to know which fruits and vegetables have the highest concentration of certain nutrients since each of the colors typically represents certain vitamins and minerals. 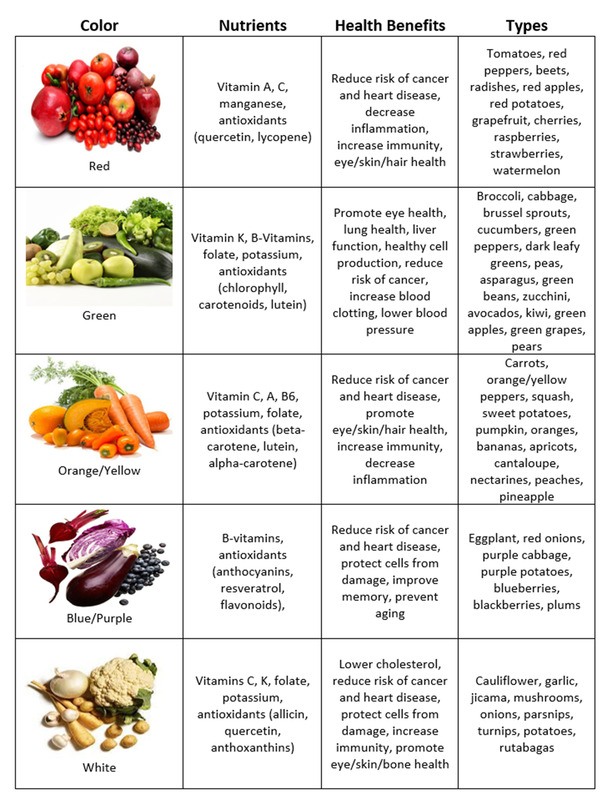 Not only do we feel more satisfied when we have a variety of choices, but “eating the rainbow” also provides our body with essential vitamins, minerals, and antioxidants which are optimal to our health and wellness. Use this chart to guide you during your next trip the the farmers market or your local grocery store. Then head over to the recipe page to make some delicious meals that are chock full of essential vitamins, minerals, and antioxidants our bodies need for their peak nutrition.